The Medium Commercial Vehicles segment is the one composed by those LCV with weight between 6,01 and 15,99 tons. It is the less popular one, with only 5,6% market share in 2012. 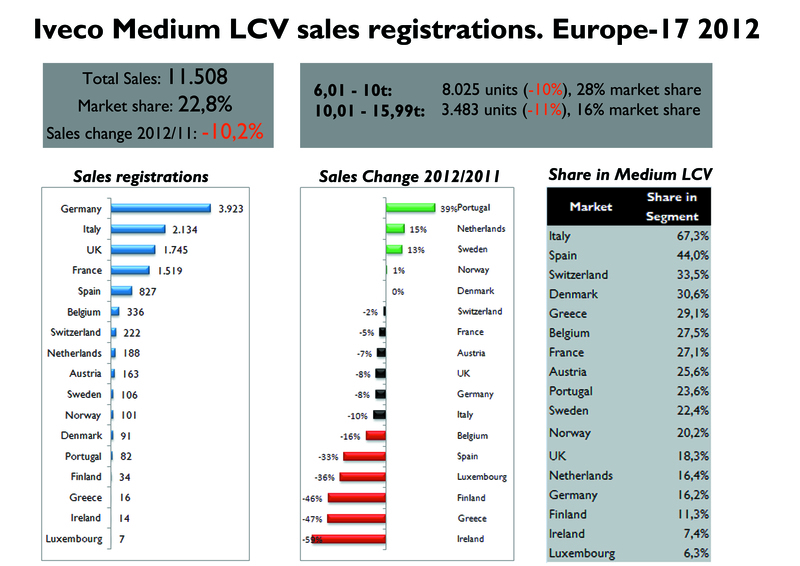 In Europe-17, there were 50.407 units sold, down 7,3%. 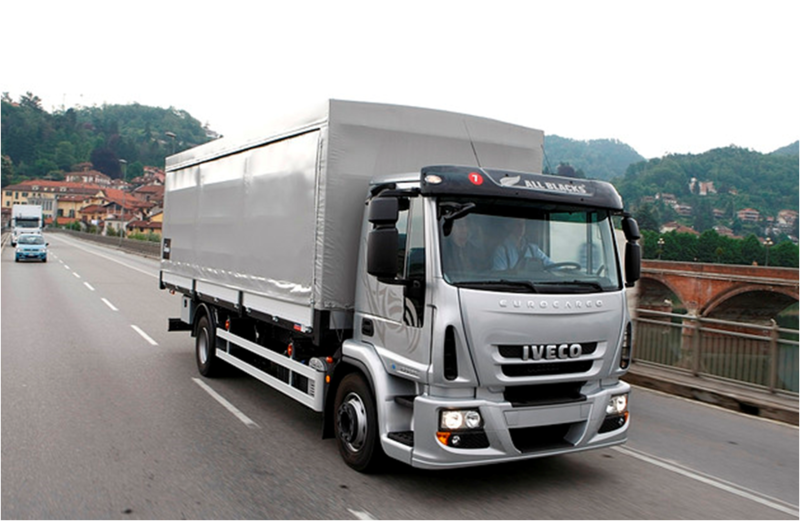 However, it is where Iveco has its best market share, thanks to the Eurocargo truck. As it happens to the Light Commercial Vehicles segment, the Medium one is also divided into groups: those trucks weighing 6,01 – 10 tons, and those with a weight between 10,01 – 15,99 tons. Iveco owns 23% of the segment, and is close to the leader, Mercedes-Benz, which has a 30,4% market share. Regarding he composition by countries, only UK figures were positive, up a healthy 16%. Germany continues to be the largest market, with more than 24.000 units sold, followed by UK with 9.500 units, and France with 5.600 units. Greek sales shrunk in 2012: -64%. But Portugal, Spain, Finland and Italy had very bad results as well. Iveco leads in Belgium, Denmark, Switzerland, Greece, Italy and Spain. It occupies place #2 in France, UK, Norway, Austria and Portugal, and was the second best-selling brand in Europe-17 during 2012. 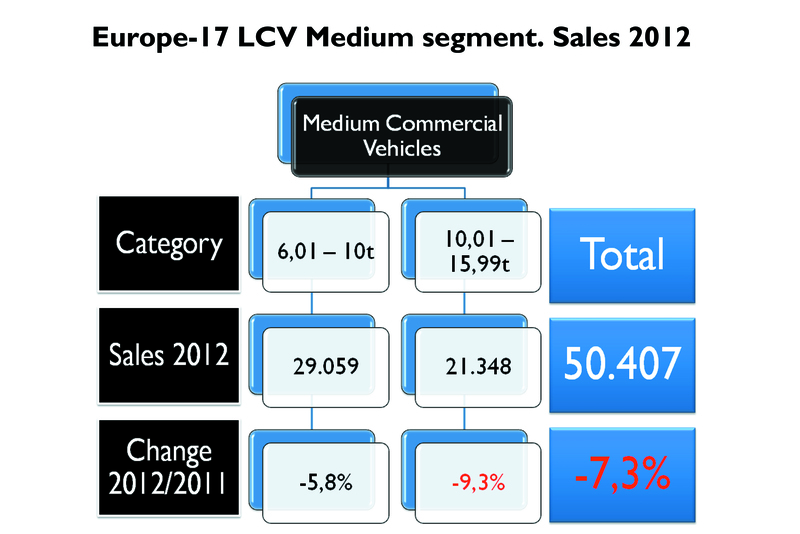 Iveco sales in this segment fell -10,2% against 7,3% for the whole segment, and -6,3% for Mercedes-Benz. 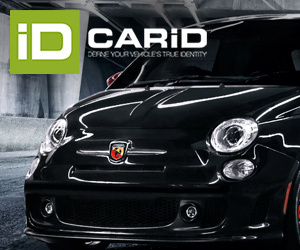 It means the Italian brand lost market share, from 23,6% in 2011 to 22,8% in 2012. In the category of 6,01 – 10 tons, it had a 27,6% market share, and 16,3% share in the 10,01 – 15,99 tons category. In terms of market share, the brand shines in Italy (61% of Medium LV segment), Spain, Switzerland and Belgium. It gained a lot of basic points in Portugal (where it was able to increase its sales, despite the big fall of that market), Greece and Italy. Even if there is no official data, the Mercedes-Benz Atego should be the best-seller of this segment. The MAN TGL is another important player, along with the Iveco Eurocargo. Iveco Eurocargo (left) vs. Mercedes-Benz Atego (right top) and MAN TGL (right bottom). They all make part of the Medium LCV segment. How about some info about market shares by manufacturer? 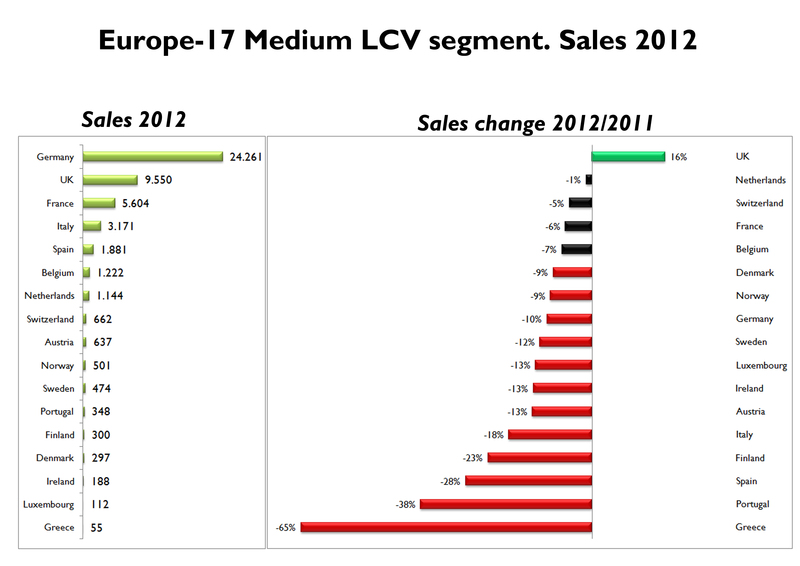 You only show the sales numbers for Iveco, not for any others. Who are the market leaders, and are they losing or gaining share? It seems that Iveco gained shared in Italy but lost quite a lot in the UK (two of the top four markets), why did that happen? Unfortunatelly I didn’t get all information. I would also liked to figure out why of that.